Something I've noticed after moving from a soldered-die Phenom II to a Core i7 with its very high heat density and thermal paste, is how the stock fan profiles seem to be quite poorly configured for high-performance cooling solutions. Let me explain. With something like my Phenom II with its fairly large, soldered die, and decent thermal transfer between the heatspreader and heatsink, the junction temperature would stay fairly close to that of the heatspreader thanks to the low thermal resistance path, and the same was true between the IHS and the heatsink (hence the purpose of the IHS). Therefore, the reported junction temperature was a fairly good representation, with an offset of course, of the temperature of the heatsink itself which in turn meant this information was directly useful to control the fan speed. Put another way, if things started to get warm, increasing the fan speed was likely to be useful in cooling everything down. However this isn't quite so straightforward when you look at something like a Kaby Lake i7. Load it up to 100% and the junction temperature rockets up almost instantly to say 70C, yet temperatures from the heatspreader onwards are barely lukewarm. That high thermal resistance step between the die and IHS is throwing a spanner in the works. Fan profiles are still seeing this junction temperature and whacking fan speed up to hairdryer levels, and many people seem to be running out and spending far more money on things like AIO coolers to remedy this, but this seems wholly unnecessary in many cases. As an analogy, you have an obstruction in your plumbing and you're 'solving' this by installing wider and wider pipes after the obstruction. CPU TDPs haven't changed much for a long time, yet more and more expensive CPU coolers seem to be becoming almost the norm! We really shouldn't be having to spend £100+ on a cooler just to maintain reasonable noise levels on a stock system! I almost feel like the odd-one-out for thinking £25 is more than enough for cooling a stock CPU adequately. But back to fan noise, because of this thermal 'obstruction', just ramming more air through the heatsink fins probably isn't making a whole lot of difference if it's already stone cold! Motherboard manufacturers have access to all of these CPUs, so it would be much better IMO if they could be a bit more intelligent about how their fan profiles work, by increasing fan speeds when it will actually make a significant difference e.g. in line with estimated heatspreader temperature. Now, of course we don't usually *have* a sensor on the heatspreader, but we can ballpark it with an offset to the junction temperature. E.g. if we see idle of 30C and a near-instant jump to 70C under load, we can be fairly confident that there's a ~40C delta between them, so to start the fan ramp after this initial on-load temperature. I've had a play with this myself, and reducing the fan curve from 100% around this point, right back to idle speed, makes barely any difference to load temps, so what exactly is the use in putting up with irritating fan noise? It would be interesting if there was an automated way of ramping through fan speeds with the CPU under load, to better demonstrate this, and to try it in individual systems in order to make a better informed decision about fan curves. Any thoughts on how we could try this? Last edited by watercooled; 22-04-2017 at 06:33 PM. I can't speak for all systems, but I thought most enthusiast motherboards recognise this problem; and have quite elaborate fan speed tools? I know on my Asus Z97-I, there is an option on the Ai Suite, which you can see under the fan-speed graph called 'Spin up time' which is a sort of delay. In the event of the spikes you mentioned, it won't spin up till the time has been exceeded. Is there nothing in your BIOS or motherboard tools which does this for you? And before anyone comments on my fan speed curve, I've taken a step back on overclocking, and a 240mm AIO cooler sits on top of my CPU so it hardly ever exceeds 50*c. The quiet is enjoyable. I haven't overclocked in ages so don't usually bother getting fancy motherboards, however the past few I've used/played with seemed fairly similar with a fan curve like the one in your picture, it's just the default profiles/presets I'm moaning about really - they mostly seem to start the ramp at something like 50C which is IMO far too low, and reaching 100% or close to it far too early. 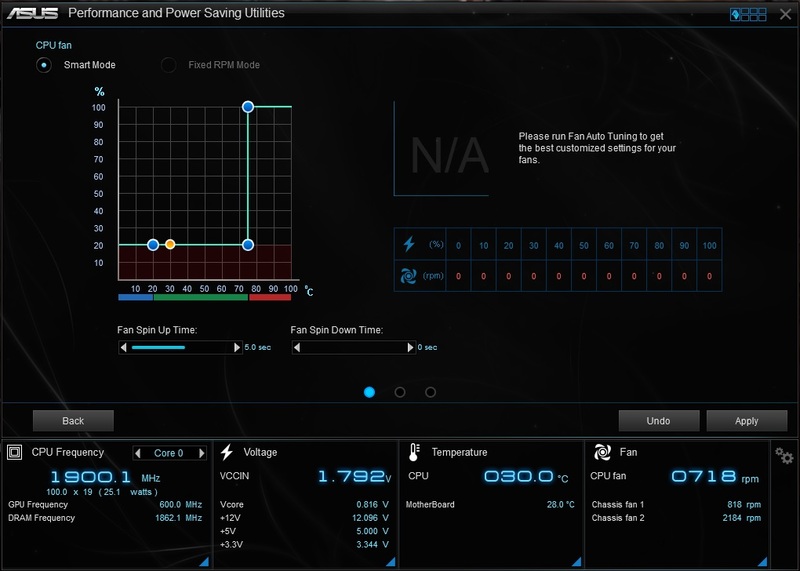 On these boards it is of course possible to manually set up the speed curve and set min/max duty cycles for example, but it would be so much more useful if the 'silent', 'normal' and 'performance' were set up properly for realistic junction temps, rather than all of them resulting in 'loud' as soon as the CPU is loaded. That spin-up delay is a nice touch and something I don't think is present in the BIOS menus of my board (also an Asus incidentally), but I'll check again in case I've missed it. Or perhaps the option is available in the software but not displayed in the BIOS menus? I'm just wary of motherboard software after the bizarre issues I've had with it over the years! Me? Nope. If you're wondering about the exact temperatures I gave, they're just examples for the sake of explaining it, but they're in the right ballpark off the top of my head. Just FYI this isn't intended as a rant about the thermal path in Intel's CPUs - that topic's been more than covered! @watercooled, I think 50*c is a reasonable place to start ramping up the fan, but some smoothing of the temperature data would be good to help prevent fan speeds going all over the place. On the plus side, most stock coolers are quiet at the expense of performance. So casual users will not notice their fan speeds bouncing. They get throttled but may not know it, and just think 'this is how fast this processor runs'. It depends on the CPU, but for the current high-clocked i7s, 50C is possibly a bit low (at least for air coolers) for reasons I've already explained - it simply doesn't make any appreciable difference to temperatures and is annoying for no reason. If the heatsink is already barely above ambient temperature, forcing more air through it is not going to achieve anything given you can never drop it below ambient, and the significant temperature delta between die and heatsink will always exist due to the way Intel's desktop CPUs are manufactured. It will of course vary depending on your individual CPU; its own construction and stock voltages, but it's easy enough to play around with if you have a bit of time. Load up your CPU with say y-cruncher with your fan set to 100%, and continue to turn it down until you start to see an appreciable increase in temps. In my case with a CM 212, 70C seems to be a reasonable goal as this is around the point where continuing to increase fan speed makes little difference. Increasing the heatsink's intake temps e.g. with GPU load will offset this value too, but again there's still not much you can achieve by blasting more warm air through the heatsink. But then again, no game is going to load the CPU as harshly as a program like y-cruncher does. I guess what I'm getting at is, if you're achieving nothing by increasing fan speed and temps are OK, there's likely some room to decrease noise for no real cost! Just thought I'd post a quick update to this. I finally got around to some more testing - I had a load of rendering to do so downloaded SpeedFan and played about with fan speeds on-the-fly. Under motherboard control, the fan was at about 1700rpm, with the package temperature hovering around 77C after I'd given everything a chance to warm up. I played with PWM % until I found the point at which the fan made itself known and 50% PWM, ~1300rpm seems to be just before it starts significantly increasing in volume, so I started with that. So, at 50% I left it for a while to stabilise and it barely moved - around 77-78C. It does bounce around regardless of fan speed and HWmonitor registered a max of 80C vs 79C on stock, but TBH there's nothing in it and that could just be because it had been running for longer. For kicks I set fan speed to 100%, ~2050rpm, and it again bounced around 77C. So there you have it - depending on your cooling solution, you probably have a lot of room to decrease fan speeds with effectively no impact on CPU temperatures. Airflow over the heatsink just isn't the 'bottleneck' with these CPUs when paired with a half-decent heatsink. It's worth noting I'm testing with just CPU load here, so it might be worth some additional tests when it's pulling in warm air from a GPU during gaming and/or just use the CPU-only load temps as a reference point and allow fan speed to increase more if they get another 5C or so higher. That way, the noise will make you aware of the higher temps, but I doubt many games will hit the CPU as hard as maxing it with this sort of workload anyway. And one last thing, for anyone playing with SpeedFan, I had to go in and change some settings to get it to actually work for changing fan speeds. YMMV so be very careful what you change, and if in doubt, leave it alone!!! This is what worked for me: click on configure and under the 'Fans' tab, see what chip is listed next to 'CPU Fan'. Then, click on the 'Advanced' tab and use the drop-down menu to select that chip. It lists PWM modes for a number of fans, in my case the CPU was PWM2, which I had to change from Smart Fan IV to Manual in order to take back control from the BIOS fan control. Be sure to change things back to the way they were when you're finished playing with it, unless you're going to use SpeedFan as a permanent solution, but you're on your own with that one as I've not tried it. Rant edit: Asus, in their infinite wisdom, have decided 75C is the point at which they will run the fan at 100% 'to prevent damage'. I get the principle, but 75C is a daft cutoff point - that's a perfectly reasonable load temperature for a recent i7! Asus FAIL! On the other hand, it doesn't seem to work properly. After pulling the 75C point down to 55%, the CPU is currently running at 77C and around 1300rpm anyway. I will investigate alternative control methods and/or a fan which is just slower (quieter) even at 100%. Motherboard manufacturers could really do a better job of profiling the CPUs they're producing boards for. Last edited by watercooled; 27-05-2017 at 06:21 PM. Be sure to change things back to the way they were when you're finished playing with it, unless you're going to use SpeedFan as a permanent solution, but you're on your own with that one as I've not tried it. I've recently switched to it as a permanent solution, and it's worth the time I invested in learning it. Bios control limits fans to two speeds really - the starting speed and increased speed (after the temp is reached), with the increased speed erring on the side of caution and therefore being a bit of a noise pain. In the absence of branded mobo software, speedfan can eliminate unnecessary noise. It's biggest asset is being able to set a curve for three pin fans without having to splurge on a fan controller. Yeah I'm leaning towards setting it up as the BIOS profiles have bizarre restrictions (as I mentioned in my edit). Like I say I understand why there's a failsafe, but the temperature limit is unreasonably low for air cooling. It is warm, but when maxing the fan demonstrably does nothing to improve the situation, and when it's well below the tjmax, what is the point in doing it? I even started going below 50% and although I didn't leave it there for long, it still didn't seem to result in higher temps - but since the 50% mark isn't annoying I'm happy to leave it there for normal load temps. Some AIO coolers have the right idea - they set radiator fan speed based on coolant temperature. If the coolant is still stone cold, they don't bother increasing fan speed as it would make no difference to the CPU's core temperatures. Maybe with some additional competitive pressure from AMD, Intel will consider remedying their awful IHS mounting solution. It doesn't even have to be soldered - I've read claims that it's impractical to solder such small dies - but delidding and replacing the stock TIM with something better and/or reducing the size of the gap between the die and IHS can make a huge difference. Is the cutoff point negotiable? Like, does it only kick in when the bios fan control is enabled, and go away when disabled? Yes, controlling the fan using SpeedFan overrides it. Wow, it's that time again - your biannual post! Time flies! But good to see you back here, hope all going well for you!